VALENCIA, Spain — RS is Ford’s performance sub-brand. It’s what M is to BMW, and what AMG is to Mercedes-Benz. 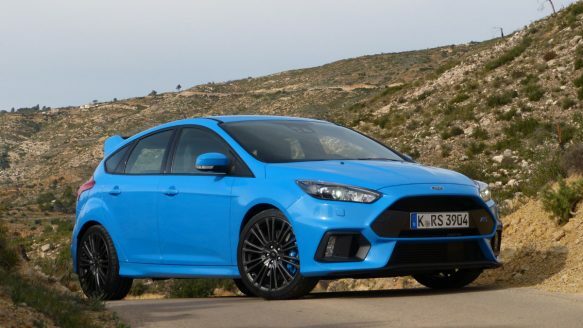 Up until this spring, when the $46,969 Focus RS arrives in Canada, we’ve never had an RS model in this country. With 350 horsepower, a four-wheel drive system, Recaro seats, Brembo brakes, Michelin Pilot Sport Cup 2 tires — what’s not to like? The basically good Focus chassis was stiffened by 23 per cent over the standard model, and by 9 per cent over the previously hot hatch variant, the ST. Stiffer springs give the required control. Two-stage dampers have a Sport setting that is 40 per cent stiffer than Normal, a larger spread than usual for variable dampers, to emphasize the dual road/track nature of this car. The 2.3-litre EcoBoost four cylinder engine from the Mustang gets more power (350 versus 310 in the ‘Stang), mainly from a bigger twin-scroll turbocharger, a new cylinder head and improved intake and exhaust systems. No fewer than three exhaust systems were built and tested before they found the right sound. The RS team also dialed in exhaust burbles and backfires. Irresponsible. Loutish. It’s huge fun. You’re always looking for a rock wall or an underpass to drive by with the windows down just to hear it. The urge is fed through a strengthened six-speed manual transmission to an ultrasophisticated four-wheel drive system. A button on the centre console calls up Normal, Sport, Race Track or Drift drive modes, to change the steering, engine and four-wheel drive characteristics. It also adjusts the Electronic Control System response, damper stiffness and exhaust note. The dampers can also be adjusted independent of drive mode. Did I say Drift mode? Yes. YouTube rally star Ken Block worked with Ford on this car to allow anyone to drive like a hooligan. Tire-frying doughnuts for all. The power to the pavement detail was entrusted to Michelin. Sport Cup 2 tires are standard on Canadian models. With all this go, you better have some help to stop. Big 350 mm front and 302 mm rear rotors, the former clamped by Italian four-piston Brembo calipers, do the job. One design principle was to have “nothing that isn’t functional.” So that roof-mounted spoiler helps maintain zero lift front and rear at higher speeds. The grille mesh has a 85 per cent void ratio compared to 56 per cent for the Focus ST to allow more cooling air into the engine. Three Recaro seats are available, a base design, a heated one, and a lightweight ‘shell’ racing seat. As Recaros always are, the heated units in our tester were snug but comfortable and supportive. We tested the RS on hilly, twisty roads west of Valencia, where despite the raw performance, the car actually feels quite comfortable. On the Ricardo Tormo circuit where Formula One cars often test, the combination of tight technical corners and fast sweepers proved an excellent venue to try the various characteristics of the four-wheel drive system. Through a tight corner followed by hard acceleration, virtually all front-drive and most four-wheel drive cars will plow determinedly to the outside of the corner — the dreaded understeer, often ending in a curb or, worse, a tree. The usual way to deal with this is to lift, and wait for the front tires to regain grip. That means meanwhile, you’re going slower. But in the Focus RS, you counterintuitively nail it. The trick four-wheel drive system directs more torque to the outside rear wheel, tightening the line and driving the car smartly onto the following straight. This is as close to the classic rear-wheel drive feel as you’re likely to get in a front-mounted transverse-engined car. The car’s chief engineer noted that a car like this is not only about the numbers. The car makes you feel like you’re a much better driver than you probably are. And who doesn’t like to be flattered now and then? From the get-go, the engineering team working on Ford’s performance cars knew that four-wheel drive would be necessary to make the Focus RS what they needed it to be. They also knew that the typical system used on most cars today wouldn’t cut it. Most of these systems, whether they’re made by Sweden-based Haldex or not, are very similar in operation. A progressively lockable centre differential divides torque front-to-rear in a predetermined ratio. If wheel slippage occurs at either end, the centre diff engages to reduce that slippage. Johnson’s team felt this type of system was too slow in reacting to get the performance they wanted. So they looked at the promising Twinster system from British drivetrain specialist GKN. Here, the power take-off unit (PTU) up front sends torque to the front wheels, which have a torque vectoring function. If the car is not attaining the turning angle the driver wants, momentary application of one or more brakes helps nudge the car back on line. Via an open differential, the PTU also turns the prop shaft heading to the back axle, where another open diff sends the torque right and left. And here’s where it gets clever. Electronically-controlled clutch packs in each rear axle half-shaft can be fully open (meaning no torque is being sent to that side), completely closed (sending maximum available torque to that side) or just about any degree in between. And, independently of one another. So theoretically, one rear wheel could be full-on, the other full-off, both could be full-on or full-off, with virtually every permutation in between also possible. In this design, torque isn’t so much fed to the wheels as it is demanded by the wheels. A multitude of sensors in the car determine road speed, yaw angle, steering wheel angle, throttle position, drive mode, etc., and determine how closed each clutch should be. This can be changed something like 100 times per second, about as real time as it gets. Drive torque isn’t nominally divided front-to-rear as in most systems, although in typical operation, as much as 70 per cent can be directed rearward. Under the most sedate steady-state driving conditions — straight level road, no throttle application, no steering wheel inputs — both rear wheels will be disconnected, and the RS becomes a front-drive car, for a slight gain in fuel economy. But in about 50 milliseconds, it can wake up that back end as needed. The launch control mode — select the function, clutch in, pin the throttle (the engine sticks at about 5,000 rpm), dump the clutch, hang on — is one of the rare times when both rears would be locked solid. The near-infinite number of combinations of all these variables means it took more than two years of development for engineers and test drivers to calibrate everything. ENGINE: 2.3 litre inline four, double overhead camshafts, four valves per cylinder, variable valve timing intake and exhaust, direct injection, turbocharged. POWER/TORQUE: 350 hp / 325 lb.-ft.
FUEL CONSUMPTION (Transport Canada) L/100 km): Premium recommended, data n/a. BRAKES: Four-wheel discs, front four-piston Brembo calipers; rear single-piston Ford calipers. STANDARD FEATURES: All the usual Mod Cons (Modern Conveniences), plus power moonroof, Recaro heated seats, extra set of winter tires on alloy rims. COMPETITION: Subaru WRX STI ($45,395 for most-comparably-equipped Sport-Tech package) with 305 horses is the sofar undefeated champion better be looking over its shoulder; Volkswagen Golf R ($42,010 as comparably equipped as you can get) $39,995- less expensive, less powerful, perhaps more refined. WHAT’S BEST: Fantastic grip; excellent performance in all areas; remarkably comfortable and practical to drive when you’re not being a hooligan. WHAT’S WORST: Nothing I could determine. OK, maybe a trifle more road noise than you might want. But hey; it’s no Rolls-Royce. WHAT’S INTERESTING: For once, Canada gets it cheaper and better-equipped than the Americans. LOOKS: Bit of a sleeper; without close examination, you might not take it for anything but a Focus with cool wheels. INTERIOR: Focus-like, but Recaro seats prove it is something special. TECHNOLOGY: Unique four-wheel drive system sets a new standard. WHAT YOU’LL LIKE ABOUT THIS CAR: If this is your type of car, everything. WHAT YOU WON’T LIKE ABOUT THIS CAR: If you own a Subaru WRX STI, also everything.